Remember when auditors were, by their very definition, supposed to be the embodiment of credibility, trustworthiness and moral fibre? The Brazilian arm of Big Four auditing giant, Deloitte, forgot these simple prerequisites and as a result the US auditing watchdog fined the firm a record $8 million for what amounts to massive fraud: falsifying audit reports, altering documents and providing false testimony during an investigation that unearthed what it described as its “most serious” finding of misconduct. The US Public Company Accounting Oversight Board, or PCAOB, also penalised or barred 12 former partners, including a national practice director, and auditors of the Brazil-based Deloitte Touche Tohmatsu Auditores Independentes. The Deloitte Brazil case is the first time the PCAOB has “charged a member of the Big Four auditing firms with fraud and for failing to co-operate with an investigation” according to the FT [Financial Times]. Worse, unlike banks which resolve similar cases without admitting or denying guilt, in settling, Deloitte Brazil admitted it had violated quality control standards and failed to co-operate with the auditing board’s inspection and subsequent investigation. Not only was that not the case, but the details read like straight out of a fictional account of third-world crime. Deloitte Touche Tohmatsu Ltd, commonly referred to as Deloitte, is a UK-incorporated multinational professional services firm with operational headquarters in New York City in the United States. Deloitte is one of the “Big Four” accounting firms and the largest professional services network in the world by revenue and number of professionals. Deloitte provides audit, tax, consulting, enterprise risk and financial advisory services with more than 244,400 professionals globally. In FY 2016, the company earned a record $36.8 billion USD in revenues. As of 2016, Deloitte is the 6th-largest privately owned organisation in the United States. ● PricewaterhouseCoopers (PwC), largest accounting firm in terms of revenue. Remember the old chestnut…. The connection between TTCF (The Trusts Community Foundation Ltd; formerly, The Trusts Charitable Foundation Inc) —and Deloitte. 14.12.14 DIA regulates what? Not white collar crime, not with govt looking on! █ For more, enter the terms *pokies*, *pokie rorts*, *ttcf*, *orfu* or *dia* in the search box at right. So DDT, woops ODT, persist with their Stadium Support Policy after months of Nothing of Substance at the LOSS MAKING Stadium. One feeble rugby test only. Infrequent visits by grey-haired performers, jaded once-stars. All this for +$20million each year on your Rates. The sinkhole of all Dunedin GOB stupidities, with a direct line to Mssrs MF and EE, dear friends of Queenstown. The erstwhile owners of the local newspaper (and was it 23 delectable Rolls Royces and Bentleys later, as if Sunday night marshmellows by the roaring log fire) have the personal wealth to overlook the sheer theft by stealth and duff embellishment that is Dunedin’s LOSS MAKING stadium. Many of us find our entertainment thrills, according to income or not…. via the tea leaves, payless YouTube, internet TV, Sky, or the treat of flying to venues elsewhere in New Zealand and overseas. Without having to insinuate ourselves into the Dog Stadium of #DUD. Unless, you’ve a moronic Thugby itch, a weakness, a throwback in your understanding of national identity as brawl and brain injury…. and can live with just one test in a year, or more years…. to justify filching from the pockets of vulnerable citizens bullied into paying for Stadium indulgences of the rustler-wealthy and the toothless eroding upper echelons of the middle class. Then a little Home Show for the Non-savers amongst us. Glory! 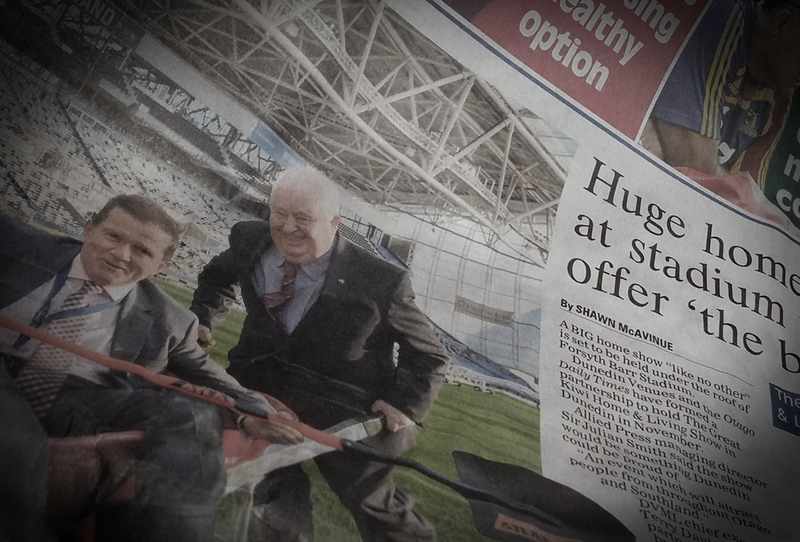 Dunedin’s 53,000 ratepayers (the hordes? far from it!) and the power users of Otago (via Aurora Energy, on notice to industry regulator, the Commerce Commission, because the lines company can’t fund sufficient renewals and upgrades to its working assets – not helped by annual subvention payments) are being Robbed Blind year in year out – to subsidise the council-owned Stadium debt servicing and operating costs. This is a complete INJUSTICE. All the games of tilted media Sway is the crippling joke landed upon those who dare to live South. More fool us for our obsequious, largely unquestioning gutless surrender. In the midst of irresponsible property speculation, low-paying tourism-exploitation, and dairy industry shortfalls, no wonder it’s harder for people to meet rates, rents and basic weekly living expenses —or indeed to feed, clothe and home our very young and our school children, or to sympathetically and safely care for our elderly, and our homeless. Hell, just add the LOSS MAKING stadium as sprinkles on top. New Zealand is now a Social-economic Monster and our Dunedin City Council is the frizzling Limb of that Heathen. What faith a turnaround in our individual and collective fortunes at Dunedin as the +$20million pa Stadium RORT continues…. ? The financial betrayal of the Chin and Climate-Change-Cull councils is WRIT LARGE as the hanging noose. The ANNUAL Stadium Subsidy – in raw terms – equals +$20million not available each year for Dunedin business diversity and development sufficient to create jobs as the much needed ratchet to gradually better standards of living for our most vulnerable residents. So ODT, here’s the middle finger to your soul-destroying misfit editorial, Stadium’s true legacy (1.7.16), its deceitful posturing : an incendiary Insult to honest Dunedin people. ODT, you socialise the parochial blindness, unquenchable greed and ultimate +$20million (annual) sins of the good old boys and flunky boosters. FO. Submitted by MikeStk on Fri, 01/07/2016 – 10:52pm. The stadium’s legacy continues to be a litany of broken promises and financial mismanagement. They’ve largely been papered over by raising taxes to pay for all these missteps, this can’t be put behind us because we continue to be forced to pay and pay for these mistakes and lies. ● Mr Farry started off, back during that first council election, promising us a stadium that would be completely privately financed and the ratepayers would simply be a backstop in case of disaster. In the end we’ll have paid more than $400m, $8000 per ratepayer. ● Then we were promised the stadium “would not cost a dollar over $188m”. Turns out they quietly spent more than $250m, forgetting things like toilets, kitchens, turnstiles and scoreboards, and neglected to include the cost of debt servicing. When we’re done it will have cost more than half a billion dollars, not including the ongoing losses from running the thing. ● Rugby promised to raise $50m in capital to pay for the stadium. They failed, then they had the DCC borrow the money and ‘sold’ the best seats cheaply to their own members with the intent that that would pay down those loans (at the same time taking income from DVML). This ended up on the books as ‘rent’ that DVML was paying DVL, crying poor DVML abandoned this plan and the council hit up the ratepayers to pay for rugby’s private fundraising – we’re still waiting for rugby’s promised private fundraising. ● Rugby’s CST promised us that the stadium would make a small profit, $175k/year. Wouldn’t that be great? Instead DVML charges too little for using the stadium, losing millions every year that are paid for by the ratepayers as subsidies to create a pretend profit. The ODT also removed my contention that Farry’s original promise that the stadium would be privately financed “turned out to be far from the truth”. They also removed the adjective “their own stupidity” describing ORFU’s decision to push for a stadium resulting in the value of their one asset crashing to 0. The buyers of Carisbrook have three weeks to pay the Dunedin City Council for the former sports ground after an earlier plan to subdivide and develop the site to meet the $3.1million debt did not eventuate. This week ODT said the mild winter had produced an increase in rodents. ODT need look no further than the infestation at its own sainted house. █ For more, enter the terms *stadium*, *orfu*, *rugby*, *carisbrook*, *pokies*, *dia*, *martin legge* or *bev butler* in the search box at right. A Wellington community stalwart, who lost three grandchildren in the Qatar mall fire, has been recognised in the Queen’s Birthday Honours. Rod Turner received the Queen’s Service Medal for service to the community, including a long career in the Army and dozens of volunteer organisations. The honour recognised “his leadership and selfless dedication to the community”. Turner spent 22 year in the military, rising to the rank of Lieutenant Colonel, before retiring and spending nine years as chief executive of the Children’s Health Camps. The piece of skirt responsible for funding irregularities* around the Centre of Excellence for Amateur Sport [for Professional RUGBY] has claimed a QB Honour. Paperwork showing this fraud is held independently. 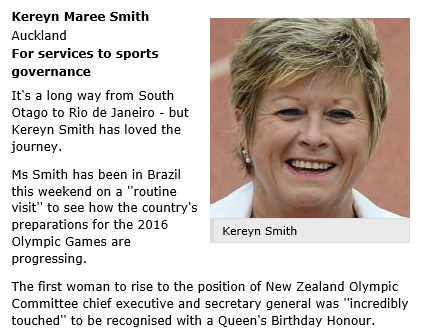 Kereyn Maree Smith, Auckland, services to sports governance. Tue, 2 Jun 2015 at 7:45 p.m. Awards all round for those associated with gambling, pokies, serious audit failings and the negative findings of the NZ Gambling Commission. Sad as the circumstances are for Ron Turner, he was a TTCF Trustee who approved grants to the Centre of Excellence for Amateur Sport in the hope of gaining ORFU’s pokie business after the ORFU had purchased the South Auckland Jokers Bars for about $3 million and so were desperate to align themselves with a pokie trust that would agree to illegally approve all the profits from those bars back to the interests of the ORFU. The DIA investigated these arrangements and deemed that ORFU had an interest/ownership in the bars and therefore could not receive any proceeds from those bars. Facing potential financial disaster it would appear Kereyn Smith and other cronies associated with the ORFU agreed to front a new trust to counter DIA action. Ex employees of ORFU, have confirmed that their contracts and pay were suddenly transferred over from the ORFU to the Centre of Excellence. The COE trustees then submitted grant applications to TTCF applying for salaries and costs that had previously been with the ORFU and avoided DIA scrutiny. According to sources and documents, the very first grant of $500k from TTCF was needed and used for ORFU to meet its financial obligations to complete the purchase of the Jokers Bars and Ms Smith signature appears as sign off for the accountability. There are serious anomalies which required proper investigation but as we know neither the DIA, the Police, the SFO or this Government are interested in proper investigations. Far easier to hold an award ceremony!! Another TTCF trustee, Warren Flaunty, NZ’s most elected man, was convicted of careless driving after causing the death of a young motor cyclist in West Auckland in 2010. █ For more, enter the terms *pokies*, *pokie rorts*, *ttcf*, *orfu*, *dia* or *kereyn* in the search box at right. A former chairman of Harness Racing New Zealand and three other people have been charged over an alleged $30 million pokie fraud. It is the biggest criminal case ever of its kind involving pokies outside of a casino. Four defendants have appeared in the Wellington District Court today over the alleged manipulation of grants which come from pokie machines, a Department of Internal Affairs spokeswoman said this morning. The defendants, charged by the Serious Fraud Office with obtaining by deception, are former HRNZ chairman Patrick O’Brien, his son Michael O’Brien, Paul Anthony Max and another person with interim name suppression. The alleged offending was uncovered during an investigation called Operation Chestnut which involved the DIA, SFO and the Organised and Financial Crime Agency of New Zealand. *The name of the fourth defendant is known to What if? -Eds. █ For more, enter the terms *operation chestnut*, *pokies*, *legge*, *whistleblower*, *rorts*, *dia*, *sfo*, *ttcf*, *gambling*, *orfu*, *rugby*, *jokers* and *racing* in the search box at right. Of course —with Professional Rugby the sense of entitlement goes a terrible long way. The Dunedin City Council, cracked and broken, has been unfairly or dishonestly “short-changed” by Otago Rugby and big brother NZRU. So too is the community of South Auckland (history: Jokers Bars, Gambling money spent out of area on Otago Rugby and Racing). What a delightful experiential and lucrative background exists to the Otago Union. Nor has prosecution of ‘the deserving’ been progressed (fact), but then NZRU and DIA are fully committed to ‘looking forward’ rather than back at their contentious and damning files that might be, suddenly(! ), lost or misplaced, or smoothly sealed and suppressed. That’s the political climate, nefariously yet continuously supported by a line-up of senior government ministers along with NZ Police, IPCA, SFO, the Auditor-general, and yes, the Ombudsmen. Doug Harvie will be glad he is now (personally) out of the spotlight. Like it never happened. Not on his watch. Like it would not in future. Doug Harvie will step down from the Otago Rugby Football Union’s board with the sport in a much better position than when he arrived. 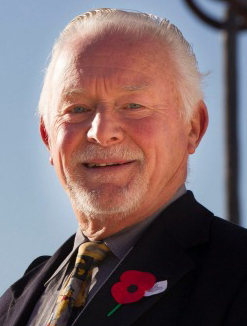 Harvie, a Dunedin chartered accountant, became chairman of the newly structured board in May, 2012. He was shoulder-tapped to stand and felt he could not say no. Harvie (57), a former loose forward for the University and Dunedin clubs, said the new board did not want to look back on why it found itself in such a tough position. It was focused on getting the business of rugby back into a good shape in Otago. Southern police officers were investigated for a range of complaints, including failure to investigate, attitude/language, and inadequate service. Complaints about bad language and bullying are just some of the reasons for disciplinary actions against some Southern district police officers. Figures released to the Otago Daily Times show dozens of southern officers have been involved in disciplinary action over the past five years, with 12 officers resigning. IPCA: “It’s our job to keep watch over Police” !!!! The Authority has the following functions and powers under the Independent Police Conduct Authority Act 1988. ● investigate incidents in which a member of Police (acting in the execution of his or her duty) causes or appears to have caused death or serious bodily harm. 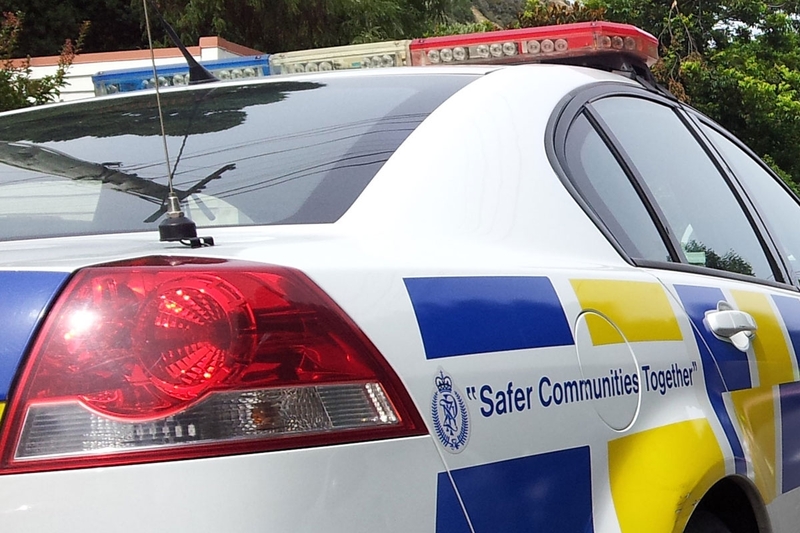 The Authority’s mission is to promote public trust and confidence in New Zealand Police. […] The Authority’s values include independence, trustworthiness, accountability, vigilance, and integrity. The Authority exists to support public expectations – as expressed by Parliament – for the justice system to be trusted and effective. The Independent Police Conduct Authority (IPCA) was established in November 2007, replacing the Police Complaints Authority. The Police Complaints Authority had been established in 1989, following several years of debate about Police accountability, sparked in part by the role of Police during the 1981 Springbok Tour. Prior to 1989, complaints against the Police were investigated internally. Through most of its life, the Police Complaints Authority comprised a single person with a small number of support staff conducting reviews of Police investigations. Because of its reliance on Police investigations, the Authority was perceived as lacking independence. Recent changes, including the appointment of independent investigators, are addressing that perception. ● the Independent Police Conduct Authority Amendment Act 2007, which changed the Authority’s name and made changes to the Authority’s powers. The period since the establishment of the Independent Police Conduct Authority in November 2007 has been one of transformation, as the Authority shifts its focus towards independent and transparent investigation of the most serious incidents and complaints. This period of change has included the appointment of additional investigators, and changes to the Authority’s legislation, structure and operations. OPINION Police like to roll out statistics when it suits them so here’s one that hurts – 17 people killed on the roads during the holiday period. That’s more than double the death toll compared with last year. And it’s despite the police’s misguided efforts to target speeding drivers with the hopelessly designed zero tolerance for speeding campaign. It’s a campaign that has utterly failed. It’s a stupid policy that needs to be scrapped. Hundreds of thousands of us will have broken the zero tolerance policy over the holidays. Good on you. I did. It was safer to do so. Police are cracking down on Uber, the cheap and trendy new-kid-on-the-taxi rank, leaving paying customers on the pavement. After complaints from the old-school taxi firms, police have begun fining the Uber drivers whose lower fares have been hurting the big cab companies. The private car hire service has hit back, lodging a complaint of police harassment with the Independent Police Complaints (sic) Authority. Uber operates as a private hire service which means the fare has to be set at the time of booking, rather than using a meter. This means Uber does not have to abide by taxi regulations, thus saving on operating costs. 24.10.14 DCC Citifleet, more revelations…. Otago Rugby —For more information, enter the terms *orfu*, *rugby*, *racing*, *pokies*, *auditor-general*, *audit nz*, *dia*, *oag*, *sfo*, *operation chestnut* and *whistleblower* in the search box at right. DIA regulates what? Not white collar crime, not with govt looking on! This one’s for Sue Ingram, DIA. Internal Affairs has abandoned an investigation into alleged irregular payments for a thoroughbred racehorse made by Sir Owen Glenn’s charity. After being under investigation for 18 months, the Glenn Family Foundation Charitable Trust charity was voluntarily deregistered on December 1. The charities regulator launched an investigation after emails appeared to show payments from the Glenn Family Foundation to a bloodstock company and Sir Owen’s personal bank account. The alleged irregular payments surfaced in an email from former trust chief executive Peter McGlashan to Sir Owen, in which he wrote “large international transfer payments you requested be made to Bloodstocks Ltd and to your account in Sydney”. McGlashan’s email stated the payments “are not typical” of a charitable trust and will “no doubt need explaining” when the charity’s accounts were being prepared. Charities service general manager Lesa Kalapu defended the length of the investigation, and lack of a resolution, saying there had been delays because Sir Owen lived overseas. “Purely because of the scale, and the international aspect to it, there were delays.” She said there was a “fair level of co-operation”. Sir Owen told the Herald on Sunday negative media coverage had forced him to leave New Zealand. 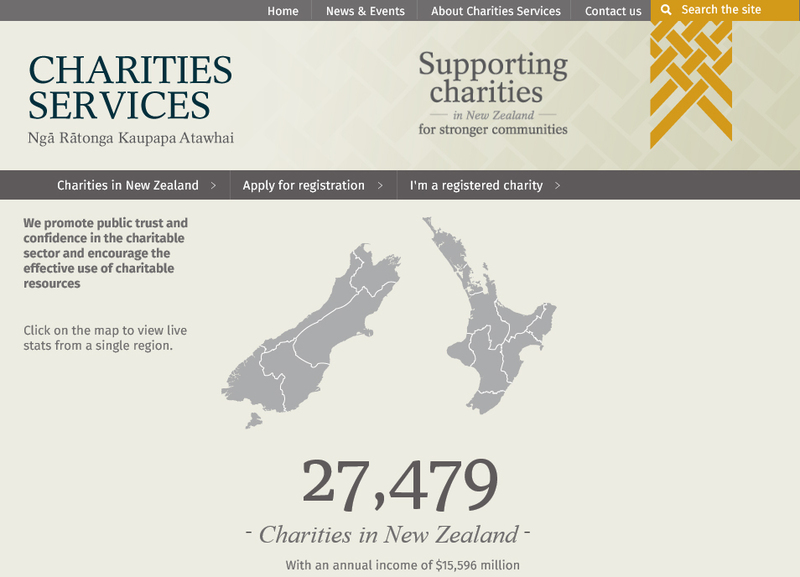 The Charities Service came under the Department of Internal Affairs in July 2012. A lot has happened, a lot of investigation files have been deliberately buried. 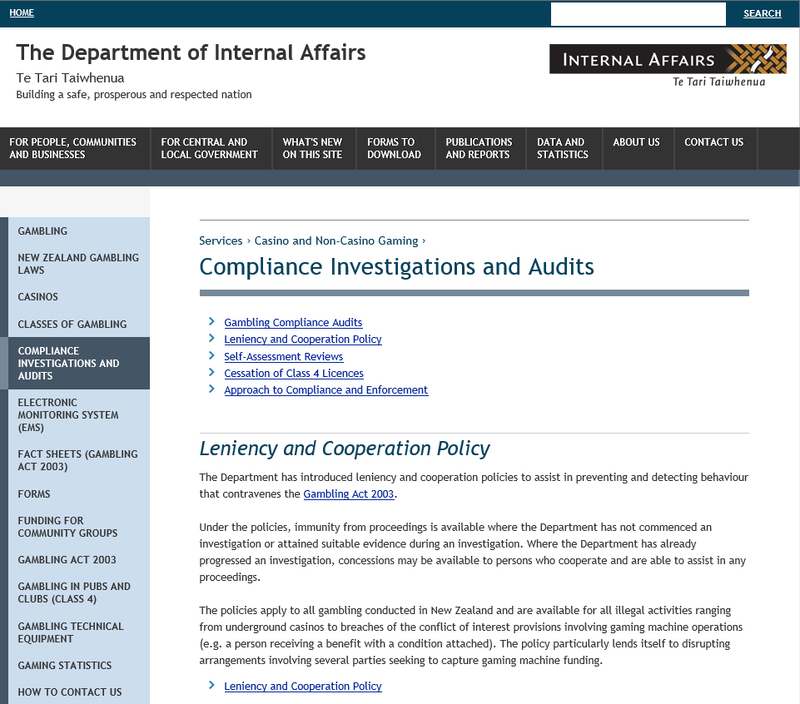 The Department of Internal Affairs (DIA) has been deficient, dissembling and politically influenced to not pursue prosecution of innumerable persons — recognised pillars of society, professional trustees, lawyers and accountants amongst them — known to be involved in multimillion-dollar white collar crime. A public disgrace, no less for the successive Ministers concerned. But don’t worry, no-one is naïve in saying this. A short reflection, by topics 2012 – 2014 . . . .
27.11.14 Sport Otago’s Brimble and ORFU’s Kinley never give up —ugly paperwork exists boys !! 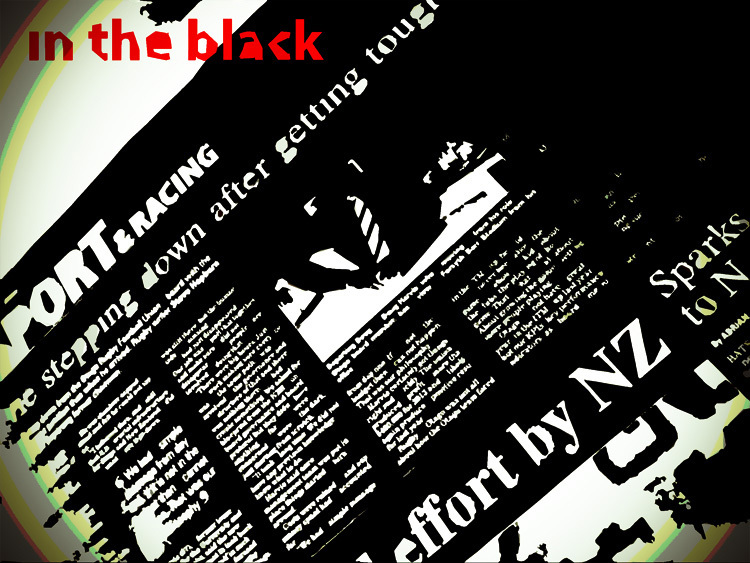 7.12.13 Corruption in NZ Sport: Where has John Key PM been hiding ?? ?